I did it! I finally did it! I have made countless cupcakes and always came up short. I was beginning to think that it wasn’t possible to make a gluten free cake that was light and airy and moist. Sure, it’s easy to make a cake that’s dense or dry. I found plenty of ways to do that. But to make a cupcake that is so unbelievably light? It’s like finding the pot of gold at the end of the rainbow. This Ultimate Vanilla Cake recipe tastes like it was made from a box mix. If I didn’t tell you it was made from scratch, or gluten free, or sugar free, you would never know! I knew I was on to something good when I couldn’t stop licking the spatula. And I am still in a state of disbelief and just how light these are. What makes this recipe the Ultimate Vanilla Cake recipe? These are perfect in every way. The cake is soft and smooth. It squishes and bounces back easily. It is delicious on its own and when paired with my Ultimate Sugar Free Buttercream, you have something sinful on your hands. I used an all-purpose gluten free flour mix. I have found that I like a local brand the best (I use Wegman’s brand). You can use your favorite blend. If your blend does not include xanthan gum, be sure to add it to the recipe. Soft and airy vanilla cake with just the right amount of sweetness. You would never know it is both gluten free and sugar free. Preheat oven to 350 degrees F. Prepare a muffin pan with liners or lightly grease. In a medium size bowl, mix together all-purpose gluten-free flour blend, cornstarch, and baking powder. Set aside. In an electric mixer, cream butter and xylitol until light and fluffy. Add eggs and vanilla extract and beat until just combined. Add half of the flour mixture and beat until just combined. Blend in the milk followed by the remaining half of the flour mixture. Beat for 1-2 minutes on medium speed. Fill muffin cups 3/4 full. Bake for 18-22 minutes until light golden and top springs back when touched. Recipe adapted from Em the Baker. Sugar Free Vanilla Italian Meringue Buttercream. Perfect for topping cupcakes and frosting cakes. Enough to top 48 cupcakes or frost and fill an 8" cake. Switch to the paddle attachment and continue beating the frosting on medium speed while adding the butter 1 tablespoon at a time. The entire 5 sticks may not be needed. Stop adding butter when the frosting has transformed into a smooth and thick texture. (Don't panic if the frosting begins to have a curdled look, this is normal. Continue to add butter and it will smooth out.) You may need to continue to beat the frosting for up to 5 minutes after adding all the butter for it to smooth out. Mix in the vanilla extract and almond extract. 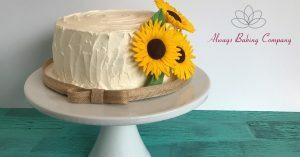 Great with Ultimate Vanilla Cake - Gluten free and Sugar free!